I tried photoshopping it some. Just for the fun of play. 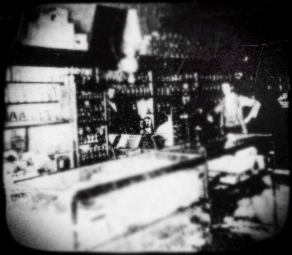 “In 1895, the Umbrite and Son Drug Store was the oldest one in western Barton County. 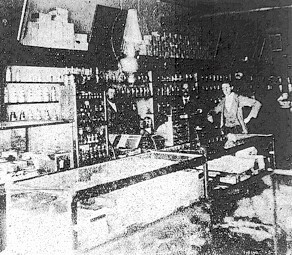 P. J. Umbrite had lived in Liberal ever since the town was founded and had had the drug store for nine years. His son, John, had passed the exam given by the State Pharmacy Board in May1895. “Those in the photo are P. J. Umbrite on the left, then A. L. Branson, and John Umbrite. The 1900 Ozark, Barton, Missouri census shows this would have been Philip J. Umbrite, who was then 47. He was from Wisconsin, his parents from Germany. He’d been married 24 years to Clara E. who was born in Wisconsin as well, her father from Vermont and her mother from New York. In the household was Ralph P. who was 10 years of age. Philip was given as a druggist and saloon keeper. He was living next to Samuel P. Horn, 48 years of age, married to Elizabeth M., who was also a saloon keeper. John Umbrite would be St. John Umbrite, also in the Ozark, Barton Missouri census in 1900. He was 23, born in Jan 1877, his parents from Wisconsin (obviously Philip J. and Clara). He was married to Frances A., also 23, who was born in Missouri, her parents from Ohio. They had a 1 year old son named Samuel P.
I don’t observe A. L. Branson in 1900. 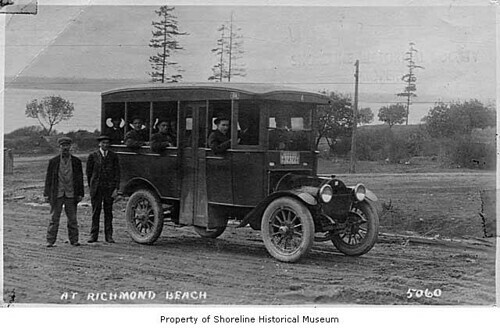 Doing a search for Umbrite I came across the following photo that is labeled as “Bus in front of Umbrite’s Drug Store, Richmond Beach, Ca. 1915”. It was further identified as being part of King County Snapshots at the University of Washington Libraries. Yes, it was. The 1920 census shows St. John Umbrite, Frances A. and Samuel P. now in Richmond, King County, Washington. Umbrite was given as a druggist. “The Era Druggist’s Directory, Volume 15, 1911” shows John in Omak, Okanogan County in Washington state. According to the 1911 and 1916 censuses, Philip J. Umbrite and Clara moved on to Canada, residing in Medicine Hat, Alberta.